Who wants some more MARCELINE? Are you ready for THE ROYALS? How about Regular Show... the MOVIE? Cartoon Network is bringing all of these and MORE to New York Comic Con 2015! With panels, signings, screenings and costume contests, fans will get exclusive insider info on Cartoon Network’s anticipated fall lineup. This year at New York Comic Con, Cartoon Network presents two epic panels starting with Adventure Time on Friday, October 9, followed by Regular Show on Saturday, October 10. During the Adventure Time panel moderated by Uncle Grandpa’s Eric Bauza (Belly Bag), New York Comic Con fans will get a first look at the special eight-part series “Stakes,” live with the cast and crew, before it airs on Cartoon Network this Fall. Regular Show fans can join series creator JG Quintel (Mordecai) and the rest of the cast and crew to catch scenes from Regular Show: The Movie, coming to Cartoon Network in November 2015. Sean Szeles will join the panel to talk about his newest project, Long Live the Royals, the latest project to be greenlit by Cartoon Network Studios’ award-winning global shorts program. Cartoon Network will present a screening and costume party at the Cartoon Network Costume Contest. Fans will get an exclusive first look at new episodes of Cartoon Network hits including Steven Universe, Clarence and We Bare Bears, and best of all, Steven Universe creator Rebecca Sugar will be on hand to present prizes! Below is a list of Cartoon Network series panels, fan events, screenings and signings at New York Comic Con 2015 Friday, October 9 - Saturday, October 10, 2015. Events as well as series producers and talent scheduled to appear are subject to change. For continuing information about Cartoon Network at New York Comic Con and for real-time updates during the convention, please follow us on Twitter at @CartoonNetPR. For years, fans have asked for it, and the magical minds behind Adventure Time are finally unlocking the secrets behind one of Ooo’s most righteous and mysterious characters! 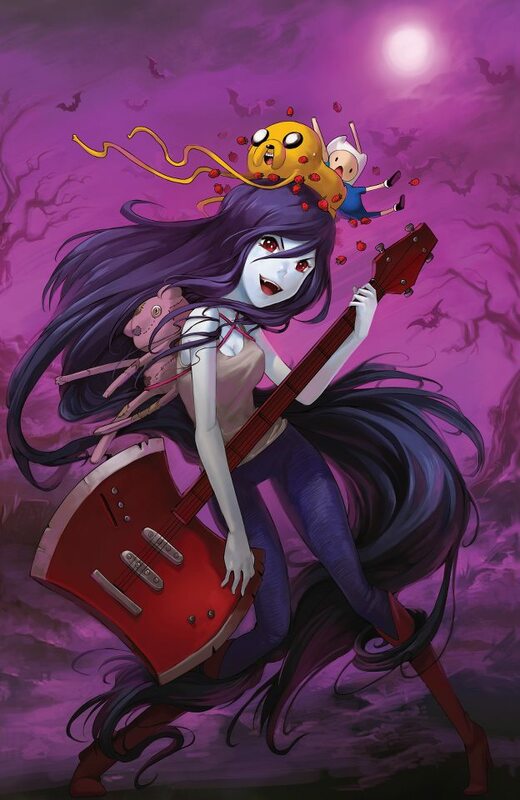 This October, Cartoon Network presents a special eight-part story that explores the life of Marceline the Vampire Queen! New York Comic Con fans will be the first to get a sneak peak of the exciting story before it airs, LIVE with the cast and crew, with plenty of time for questions from you! Moderated by Uncle Grandpa’s Eric Bauza (Belly Bag), the panel features Olivia Olson (Marceline), Jeremy Shada (Finn), John DiMaggio (Jake), Niki Yang (BMO), Adam Muto (Executive Producer, Adventure Time) and Rebecca Sugar (Lyricist/composer Adventure Time; Creator, Steven Universe). Four words: Regular. Show. The. Movie. JG Quintel (creator, Regular Show and voice of Mordecai) moderates this epic panel where cast & crew reveal the true story behind the movie. Ok, it’s really not that dramatic. But they’ll be sure to share some funny stories, scenes from the movie & exclusive announcements about the upcoming season! And that’s not all! Regular Show alum Sean Szeles (supervising producer, Regular Show and creator, Long Live the Royals) will be on hand to share his newest creation, Long Live the Royals premiering later this Fall on Cartoon Network. It’s going to be a jolly good show indeed! JG Quintel and Sean Szeles will be joined by William Salyers (Rigby), Sam Marin (Pops, Muscle Man, Benson), and Paula Spence (art director, Regular Show). Celebrate Halloween early at the Cartoon Network costume contest! Dress up as your favorite Cartoon Network character and enjoy sneak peek treats from Steven Universe, We Bare Bears, Clarence and others. Best of all, Steven Universe Creator Rebecca Sugar will be on hand to hand out prizes. It’s a scary fun time!